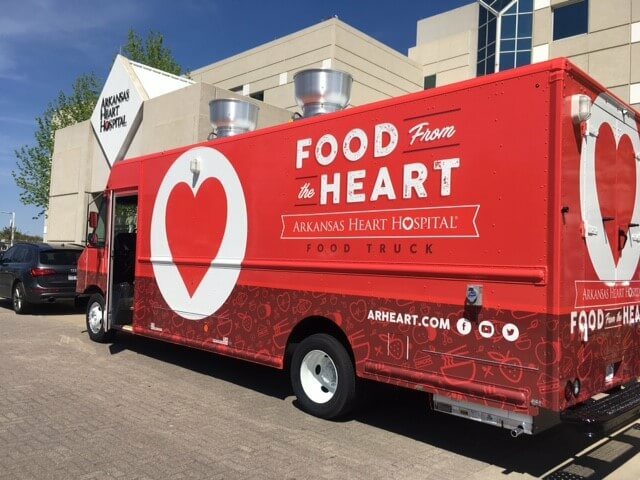 You’ll be very happy to know Arkansas Heart Hospital now has a full-time food truck. Food from the Heart starts up in May and is the first hospital owned food truck in Arkansas. Yes, you read right, ramen! If you follow this blog on a regular basis, then you know how much I think of the Arkansas Heart Hospital ramen. But the truck will also have several heart healthy options and will be popping up around three times a week. “I came up with the idea of a food truck about five years ago. It just took 4 /12 years to come to fruition,” says Chef Coby Smith. The truck will be sort of a jack-of-all trades, showing up at corporate outings, food truck stations, and even small towns throughout the state. “Food from the Heart will have multiple popup locations. Allowing us to reach our friends outside of the metro in communities where our clinics are located. When disaster strikes it will also be utilized to help feed affected areas,” Atwood said. Food from the Heart debuts on May 2 at The Food Truck Stop at 801 S. Chester from 11 a.m. to 1 p.m. in Little Rock. Expect to see Chef Coby Smith’s ramen on the menu that day.